John L. Buchanan graduated with a Bachelor of Arts and highest honors of his class from Emory and Henry College in 1856. He taught ancient languages at his alma mater and was elected professor in 1858, receiving a Master of Arts degree the same year. During the Civil War, he worked in the ordnance department of the Confederate government, resuming his teaching at Emory and Henry College after the war. He briefly served as president of the college and later took charge of Virginia Agricultural and Mechanical College. In 1885, he was appointed superintendent of public schools in Virginia and an ex-officio member of the University of Virginia board of trustees. 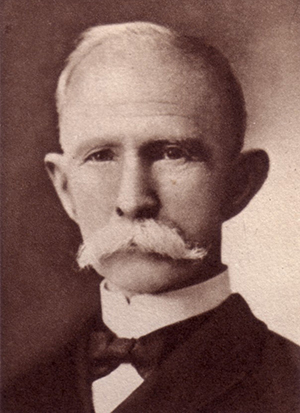 He was elected president of the University of Arkansas in 1894. During his tenure, he labored to build up the departments of the institution, raise the standard of scholarship and improve the moral atmosphere. A chair in economics and sociology was established, and independent departments of history, civil engineering and electrical engineering were created. The name of the university was changed from Arkansas Industrial University to the University of Arkansas in 1899. Construction on campus continued, with erection of a mechanical hall and a new residence hall for men named in honor of former President Daniel Hill. The first student publication, Arkansas University Magazine, and the university’s first yearbook, The Cardinal, were also begun during Buchanan’s service. He retired from the university presidency in 1902 for health reasons. The university’s first residence hall was later named in honor of Buchanan. After it was razed, his name was memorialized anew in Buchanan-Droke residence hall. Personal: Buchanan was born June 19, 1831, to Patrick C. and Margaret Graham Buchanan in Virginia. He married Frances Elizabeth Wiley, and they had nine children. He died in Virginia in 1922.